Experience: The Blog: Which Brand Will Lose the Real-Time Marketing Super Bowl? Which Brand Will Lose the Real-Time Marketing Super Bowl? It is that time of year, when families and friends gather around the television (that sounds so quaint!) to become ad critics. Oh, and to watch a sporting event of some sort, I believe. Today, there's a new game in town. The battle is not just being fought on your TV screens, where a 30-second spot this year costs $4 million. (Fun Fact: Anheuser-Busch will have to sell around 5 million cases of beer just to break even on the cost of their Super Bowl ad time, not counting ad production costs.) This Sunday, marketers will wage the same war in the trenches of Twitter and Facebook. It will be a real-time marketing showdown! While all of marketing is becoming real-time, there is a particularly tactic that is most associated with the label "real-time marketing." It starts with one large event that captivates a large percentage of consumers--an occurrence once common in the days of Lucy and Ricky but increasingly rare in our era of fractured media. Knowing the attention of so many will be split between the live event and the Twitter stream, marketers crank up their real-time marketing newsrooms and social media marketing machines. Of all the live events throughout the year, none stands taller than the Super Bowl, which makes this Sunday the, well, Super Bowl of real-time marketing. While Seattle and Denver are warming up at MetLife Stadium, conference rooms in agencies and corporate headquarters across the country will be filled with community managers hopped up on caffeine and the unshakable belief consumers cannot wait to engage with them about their brands of tires, cars, beer, lingerie, cell phone service and fast food. Armed with a library of carefully-crafted, thoroughly-reviewed, legally-approved "spontaneous" posts, this army of real-time marketers will be poised to exploit any moment of the game and leverage every hashtag consumers adopt as their own. Fingers poised on keyboards, eyes glued to the Twitter stream, thousands of social media marketers will be prepared to insert themselves into consumer conversations to try to steer the dialog away from the things consumers wish to talk about and toward tires, cars, beers, lingerie, cell phone service and fast food. Much like in football, real-time marketing has its share of euphemisms. While the Broncos and Seahawks (other than Richard Sherman) will be filling pre-game interviews with cliches like "we have to take it to the other team" or "we intend to fight for every inch"--which simply means they need to play a game of football--so too will social media marketers be relying on phrases to obscure and inflate their actual intent. Real-time marketers will be prepared to "provide relevant content," "add to the dialog" and "engage with consumers," which is just their way of saying they will attempt to spam the authentic discussion that is occurring in social networks in the hopes of improving sales or brand impression. If you sign into Twitter this Sunday evening and find brands desperately trying to jump into your conversations, blame Oreo. 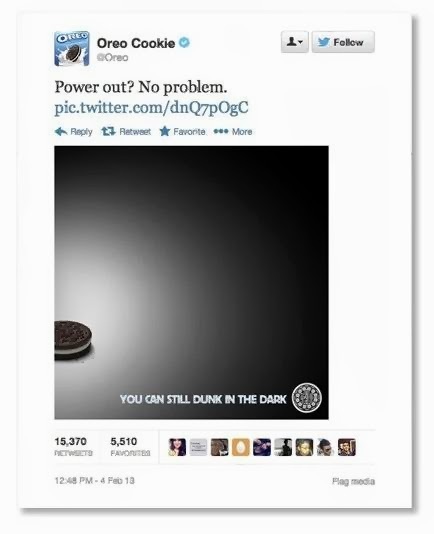 Last year, Oreo made headlines with one smart, funny, well-timed social media post, and since then marketers have been chasing the brass ring. The problem is that, as more brands try to be smart, funny and well-timed simultaneously, the brass ring gets harder to capture. During last year's Oscars, the tone turned snarky as some brands stumbled with heavy-handed, spammy posts. On Sunday, a handful of brands will get it right; they will focus more on the "real time" and less on the marketing, more on the consumer and less on the brand. Most brands, however, will not. Saddled with marketing expectations to make something "go viral" and to measure the impact to the brand, most real-time marketing will not simply fall short of goals but will damage relationships. Just one year after Oreo encouraged a thousand other brands to launch real-time marketing newsrooms, I expect this is the year when the Monday morning quarterbacking will be about the self-inflicted wounds, the blowback from annoyed consumers and the brands that reached too far for humor and ended up instead being inadvertently offensive. Sure, we will see a handful of tweets or posts that go a bit viral, but I think next week's dialog will be more about the misfires, mistakes and PR foibles. A few brands will win, but the consumer reaction for many more will fall somewhere between indifference and hostility. Which brands will lose this year's real-time marketing Super Bowl, snatching defeat from the jaws of victory? We'll find out soon. Until then, go Seahawks and/or Broncos, whichever is your preference!